These pictures give a hint of the devastation suffered by the trees in Stanley Park during the windstorms of late December 2006. Prospect Point seems to have suffered the worst. 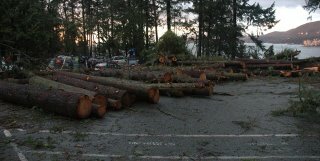 This picture shows stacks of logs in the parking lot by the café there - I assume these are just logs from trees that fell across the roadway. There are still many many limbs, branches and whole trees left lying within the forest and most of the the trails are closed. 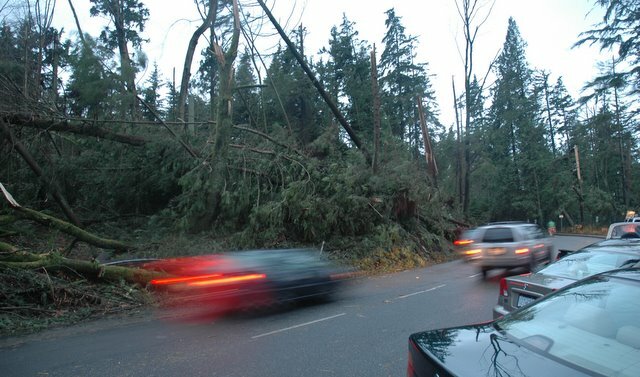 The second photo shows the damage by the road just beyond Prospect Point. As you pass the Point, the road does a tight bend back on itself and the area enclosed by the bend has almost been flattened. What I found most incredible about the damage is seeing mature trees that have obviously been snapped in half, the shredded stumps left sticking out of the ground.